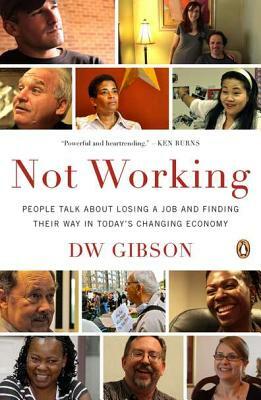 Inspired by Studs Terkel's Working and by James Agee and Walker Evans' Let Us Now Praise Famous Men, DW Gibson sets off on a journey across the United States to interview Americans who have lost their jobs. Here is the mortgage broker who arrived at work to find the door to his office building padlocked, the human resources executive who laid off a couple hundred people before being laid off herself, the husband who was laid off two weeks after his wife learned she was pregnant, the wife who was forced to lay off her husband. In telling the stories of people who could be our neighbors, our friends, our relatives, Not Workingholds up a mirror to our times, showing us the individuals behind the unemployment statistics—their fears and hopes—and offering a map for navigating our changing economy. With an extraordinary mix of pathos, anger, solidarity, and humor, it brings clarity—and humanity—to the national conversation. For information about the companion documentary film, Not Working: The Pulse of the Great Recession, please visit ffh.films.com/title/55494. DW Gibson is the author of The Edge Becomes the Center: An Oral History of Gentrification in the Twenty-First Century. He has written for The New York Times, The New York Observer, The Daily Beast, BOMB, and Tin House, and worked on documentaries for MSNBC and A&E®. The executive director of the international writers residency Writers Omi at Ledig House, he lives in New York City with his wife and their daughter.